We got the itch to makeover our fireplace mantel, just in time for fall! We re-did the mantel itself with a distressed look using chalky paint, and added some subtle coastal inspired decorations for a neutral fall look. When we bought our house, we set out to put some touches on it that would make it our own and be a beach escape in the middle of the suburbs. One of the things we did was to paint the white mantel dark brown. The brown went with our tropical sconces and ceiling fan, as well as our dark furniture. While we liked it then, it’s time for a change! So I used white chalky paint, at first using a bit of water mixed with the paint to try and give it a more transparent and washed wood look. Then, using sandpaper, I distressed the edges and random flat areas so that the brown paint would show through. After wiping off all of the dust with a damp towel, I applied a coat of wax over the paint to seal it. So now since it’s fall, it needs some sea-inspired yet fall-feeling décor to top the mantel. For me, mantel decorating is always a challenge. It can take days of tweaking, adjusting, and trying out new arrangements before I either go crazy or like the result! Thankfully, I finally found an arrangement that hit the spot. Rope, burlap, “sea oats” (wheat), and whites and creams all made for the laid-back vibe we were going for. 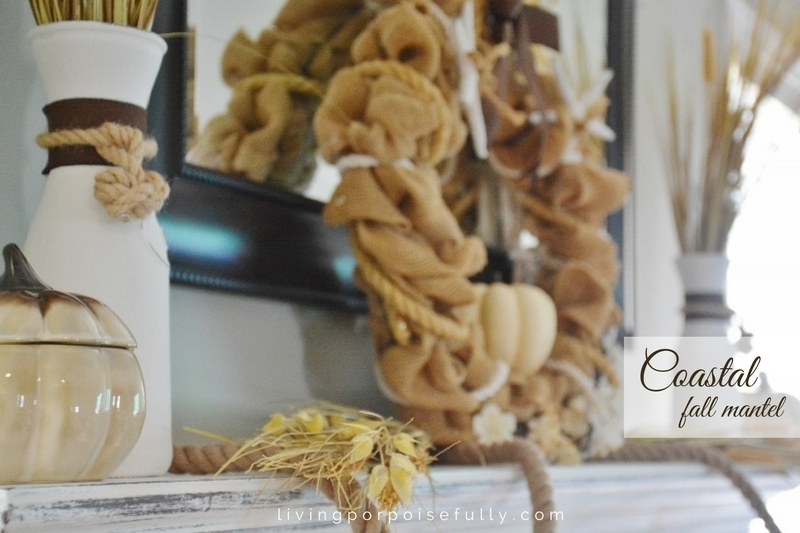 On each side, I used two of the fall vases I made (DIY instructions here) along with cream ceramic pumpkins. I re-purposed my summer burlap wreath for the middle, and replaced the flower on it with a dark brown bow and sat a baby pumpkin in the middle. I added some white nautical rope around it too. As a garland, I used decorative jute rope (0.5 in. x 7 ft) and two bunches of sea oats (wheat). The arrangement soothed my craving for symmetry (one day, I’d love to learn how to do an asymmetrical mantel!) and gave it a neutral fall palette with a bit of a coastal vibe. So there you have it, our newly finished mantel and its fall look. We’ll enjoy the fall vibe from September into November, and then tinker again for the Christmas season. But for now, it’s time to savor cup of spiced tea in front of the fireplace.